In reality, the “special relationship” between the US and the UK is a bit of a myth. For many Americans, the UK – identified as “England” – means the Queen, Monty Python, and the Beatles (or One Direction, depending on your age). But it has been a useful myth, on both sides of the Atlantic. Even if the UK needs the idea of a partnership far more than the US does, World War II, the Cold War and Churchill’s invocation of “fraternal association” have fostered lasting institutional bonds. A “first-among-equals” approach exists between diplomatic services, militaries, intelligence agencies and officials overseeing economies and finance. Now another myth about the US and the UK is being spread, but this one has no benefit. Indeed, it could be quite damaging. The myth comes courtesy of the campaign for Britain to leave the EU. It is that, freed from its shackles, Britain would again be able to embrace the transatlantic duopoly and lead the world. There is no need to worry about any effect on NATO because the British and American militaries will maintain security. The UK, the “world’s fifth-largest economy” in the repeated chants of Leave, will flourish by turning to the US as a wide-open market. Don’t take my word for it. Take the word of the US president, Barack Obama, instead. Or consider the words of the heads of those institutions that have been the bedrock of the “special relationship” – US military commanders, directors of intelligence service, past and present Treasury officials, and think tanks across the political spectrum. The fallacy that links both the Churchillian and Brexit versions of the “special relationship” is that the US-UK alliance is beyond any other ties. Washington has never viewed the relationship as exceptional, though. It has always been part of a broader US conception of working with Europe – from the fight to reclaim the continent from Nazi Germany to the stand against Soviet Communism. As the US has widened its vision in the changing world after 1945 – building relations with Asia, wrestling with the ongoing turmoil in the Middle East and building global financial structures – the approach to Europe has been increasingly important. Put bluntly, there are only economic downsides if the US restricts its business, trade, and investment to UK-first. 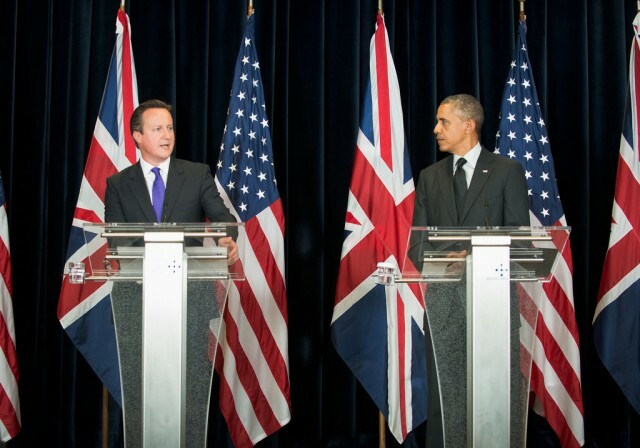 There is no military strategy that can rest on a US-UK footing, rather than US-Europe. The myths of a shared culture are a bit of fun, but they are no substitute for power politics and power economics. That was the blunt message from Obama when he visited London in April when he said: “Our focus is in negotiating with a big bloc, the European Union, to get a trade agreement done”. The UK, he warned, would be at “the back of the queue” if it left that bloc. While Britain will remain an attractive centre for finance even outside the EU, it should not take its global primacy for granted when it is no longer the gateway to Europe. The US military and State Department added its voice with a letter from 13 former national security officials, including former secretary of state Madeleine Albright: with Brexit, Britain’s “place and influence in the world would be diminished and Europe would be dangerously weakened”. [Our] partnership is at an inflection point….The chances of the European Union’s pulling together, regaining its self-confidence, fixing its flaws and meeting the challenges are far greater if the United States doubles down on its own big bet on European unity as a vital national interest. Precisely because of the special relationship, it is vital that Britain’s leaders lean in to the cause and not opt out. Apart from Donald Trump – more about him later – the verdict is unanimous: the US-UK relationship rests on continued British membership of the EU. I suspect that the shrewder proponents of Brexit realise this. But of course, to acknowledge the real world would damage their campaign. So instead they try diversionary tactics. Ignoring the key American institutions, Nigel Farage blithely dismissed Obama: “[He] won’t be in office by the time we’re out of the EU post-referendum”. Johnson went further, with a personal attack on Obama. Repeating a lie that the president had removed a bust of Winston Churchill from the oval office, he said this “part-Kenyan” had an “ancestral dislike of the British empire”. Others suggest the US can’t have an opinion on UK immigration until it happily opens its border with Mexico. None of this gets to the central point about the US conception of Britain’s place in Europe. Nor has any Brexit campaigner come to grips with the forthright statements from America’s diplomatic, economic, and military leaders. But not getting to the point is the point. Brexiters don’t want the potential damage to sink in before the people vote. So Brexit’s hope rests on Donald Trump – who just happens to be visiting Scotland the day before the vote. Hillary Clinton shares Obama’s vision of UK-European relations. Her message is of continuity in economic, political, and security relations. But with Trump, who knows? In early May, he said it was his “feeling” that Britain should leave the EU, citing the issue of migration as “a horrible thing for Europe”. And this week Trump repeated: “I would personally be more inclined to leave, for a lot of reasons like having a lot less bureaucracy”. Those views are not exactly well-formed. They do not even go beyond Trump’s “personal” response. But maybe, just maybe, for the Leave camp, they offer hope that the special relationship can survive outside the EU. That is a pretty desperate hope. The “whole strength” of the US-UK relationship rests not on a single, unpredictable man but on the steadier foundation of institutional ties built up over 75 years. If a President Trump tries to whisk Brexit Britain towards a Utopian horizon, he will probably be brought to earth by all those officials who have seen where power and mutual benefit actually reside. That place for both Washington and London is with and within Europe – not outside it. Next Post Six months after its last election, Spain is having another. Here’s what you need to know.